Doll Quilt Swap but I'm scared, very scared. I just keep putting it off and walking away from it. Hard to cut into the fabrics and hope what I have planned works out. I really don't want to do the math. I just want to just start sewing. I was thinking the same thing about the fabrics, I would love a surprise mix bag from you guys! You always have the coolest patterns! Love the fabrics! Good Luck! I know it will be fabulous! oooh I love the fabrics you picked too! I have the top done for mine...mine looks more like a table runner, oh well!! You will do great just do it!! oh i think you're in trouble. no just kidding you're gonna be fine. but yeah you gotta start. I love all the colors you have chosen! 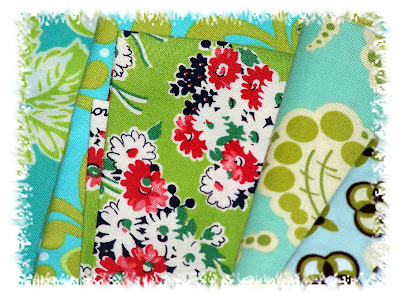 love the fabrics you chose!! can't wait to see what lovely quilt comes out of it. Wait! I love that alexander henry floral that you made your Lilly Apron out of & my little basket. I don't think that needs to be in there. What would I do with it? Probably nothing, but stare at it. I'll just go look at my basket. Cute...can't wait to see it. cant wait to see what you come up with because i am loving those fabrics! Love the fabrics. Good luck! 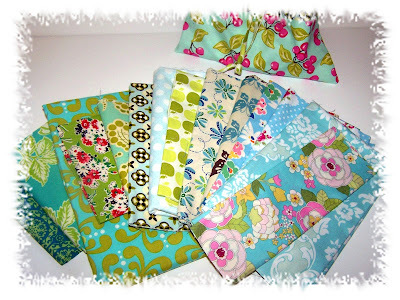 Great fabrics for a beautiful doll quilt. What great fabrics! I've cut back on swaps because I get so nervous about them. But then when I receive the items from my swap-ee I love them. Can't wait to see your doll quilt.